The Duke of Argyll (Scottish Gaelic: Diùc Earra-Ghàidheil) is a title, created by Letters Patent in the Peerage of Scotland June 23, 1701 and in the Peerage of the United Kingdom April 7, 1892. The Earls, Marquesses, and Dukes of Argyll were for centuries among the most powerful noble families in Scotland, Great Britain and the United Kingdom. They played a major role in Scottish and British history throughout the 16th, 17th, 18th and 19th centuries. The Duke of Argyll is also the Chief of Clan Campbell, the Master of the Household of Scotland, and holds numerous other hereditary titles and offices. Sir Colin Campbell of Lochow was knighted in 1280. In 1445 James II of Scotland raised Sir Colin's descendant Sir Duncan Campbell to the peerage to become Duncan Campbell of Lochow, Lord of Argyll, Knight, 1st Lord Campbell. 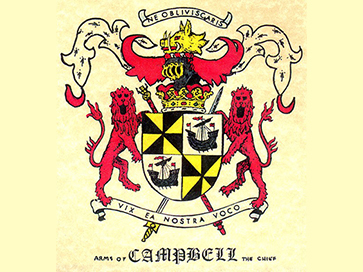 Colin Campbell (c. 1433–1493) succeeded his grandfather as the 2nd Lord Campbell in 1453 and was created Earl of Argyll in 1457. The 8th Earl of Argyll was created a marquess in 1641, when Charles I visited Scotland and attempted to quell the rising political crisis (and the fall-out from the event known as The Incident). With Oliver Cromwell's victory in England, the marquess became the effective ruler of Scotland. Upon the restoration, the marquess offered his services to King Charles II but was charged with treason and executed in 1661. His lands and titles were forfeited but in 1663, they were restored to his son, Archibald, who became the 9th Earl of Argyll. In 1685 the 9th Earl was executed for his part in the Monmouth rebellion. On 21 June 1701 the 9th Earl's son was created Duke of Argyll, Marquess of Kintyre and Lorne, Earl of Campbell and Cowal, Viscount of Lochow and Glenyla, Lord Inveraray, Mull, Morvern, and Tiree for his services to William of Orange. His son, the 2nd Duke, was created Baron Chatham and Earl of Greenwich in 1705 as a reward for his support for the Act of Union and further elevated to the title Duke of Greenwich in 1719. Upon his death his Scottish titles passed to his brother and the English titles became extinct. The 5th Duke sat as a member of parliament for Glasgow until his father's accession to the Dukedom in 1761 disqualified him from representing a Scottish seat. He then became the member for Dover until 1766, when he was created Baron Sundridge and obtained the right to sit in the House of Lords. On 17 April 1892, the 8th Duke was created Duke of Argyll in the Peerage of the United Kingdom. Thus, the Duke is one of only five people to hold two different dukedoms, the others being the Duke of Cornwall and Rothesay, the Duke of Buccleuch and Queensberry, the Duke of Hamilton and Brandon, and the Duke of Richmond, Lennox and Gordon. Historically, several other peers have held multiple Dukedoms, including the Duke of Newcastle upon Tyne and Duke of Newcastle-under-Lyne, the Duke of Argyll and Duke of Greenwich, the Duke of Monmouth and Duke of Buccleuch and the two Dukes of Queensberry and Duke of Dover and some other mainly Royal Dukes. The most high, potent and noble prince his Grace Torquhil Ian Campbell, Duke of Argyll, Marquess of Kintyre and Lorne, Earl of Argyll, Campbell and Cowal, Viscount Lochawe and Glenyla, Lord Campbell, Lorne, Kintyre, Inveraray, Mull, Morvern and Tiree in the peerage of Scotland, Baron Sundbridge of Coombank and Baron Hamilton of Hameldon in the peerage of Great Britain, Duke of Argyll in the peerage of the United Kingdom, Baronet of Nova Scotia, Hereditary Master of the Royal Household in Scotland, Hereditary Keeper of the Great Seal of Scotland, Hereditary Keeper of the royal castles of Dunoon, Carrick, Dunstaffnage and Tarbert, Admiral of the Western Coasts and Isles, and Chief of the Honorable Clan Campbell, MacCailein Mór. The Duke of Argyll's Heir's Courtesy Title would be the Marquess of Lorne. The Marquess of Lorne's Heir's Courtesy Title would be the Earl of Campbell. The Earl of Campbell's Heir's Courtesy Title would be the Viscount Lochaw. An interesting note: Only 12 of the 828 hereditary peerages of England, Scotland, Great Britain, Ireland and the United Kingdom are so ennobled as to have three generations of courtesy titles. Married: (1) 3 Aug 1802 Elizabeth Campbell (dsp. 9 Aug 1818), 1st dau. of William Campbell of Fairfield, co. Ayr, by his first wife Sarah Cunningham, of Cambridge, New England, USA. They were divorced six years later without issue. Married: (3) 8 Jan 1831 Anne Colquhoun Monteath (b. 1801; widow of Dr George Cunningham Monteath, of Glasgow; dsp. 25 Feb 1874), 1st dau. of John Cuninghame of Craigends, by his wife Margaret Cuninghame-Fairlie, 1st dau. of Sir William Cuninghame-Fairlie of Robertland, 6th Bt. Married: Never Married. No issue.